Kleiber's law () is one of those “laws” of nature that is both derived from, and seems to fit quite well with, empirical data. It applies to most animals, including humans. The law is roughly summarized through the equation below, where E = energy expenditure at rest per day, and M = body weight in kilograms. Because of various assumptions made in the original formulation of the law, the values of E do not translate very well to calories as measured today. What is important is the exponent, and what it means in terms of relative increases in weight. Since the exponent in the equation is 3/4, which is lower than 1, the law essentially states that as body weight increases animals become more efficient from an energy expenditure perspective. For example, the energy expenditure at rest of an elephant, per unit of body weight, is significantly lower than that of a mouse. The difference in weight does not have to be as large as that between an elephant and a mouse for a clear difference in energy expenditure to be noticed. Moreover, the increase in energy efficiency predicted by the law is independent of what makes up the weight; whether it is more or less lean body mass, for example. And the law is very generic, also applying to different animals of the same species, and even the same animal at different developmental stages. Extrapolating the law to humans is quite interesting. Let us consider a person weighing 68 kg (about 150 lbs). According to Kleiber's law, and using a constant multiplied to M to make it consistent with current calorie measurement assumptions (see Notes at the end of this post), this person’s energy expenditure at rest per day would be about 1,847 calories. A person weighing 95 kg (about 210 lbs) would spend 2,374 calories at rest per day according to Kleiber's law. However, if we were to assume a linear increase based on the daily calorie expenditure at a weight of 68 kg, this person weighing 95 kg would spend 2,508 calories per day at rest. The difference of approximately 206 calories per day is a reflection of Kleiber's law. This difference of 206 calories per day would translate into about 23 g of extra body fat being stored per day. Per month this would be about 688 g, a little more than 1.5 lbs. Not a negligible amount. So, as you become obese, your body becomes even more efficient on a weight-adjusted basis, from an energy expenditure perspective. One more roadblock to go from obese to lean. Now, here is the interesting part. It is unreasonable to assume that the extra mass itself has a significantly lower metabolic rate, with this fully accounting for the relative increase in efficiency. It makes more sense to think that the extra mass leads to systemic adaptations, which in turn lead to whole-body economies of scale (). In existing bodies, these adaptations should happen over time, as long-term compensatory adaptations (). The implications are fascinating. One implication is that, if the compensatory adaptations that lead to a lower metabolic rate are long term, they should also take some time to undo. This is what some call having a “broken metabolism”; which may turn out not to be “broken”, but having some inertia to overcome before it comes back to a former state. Thus, lower metabolic rates should generally be observed in the formerly obese, with reductions compatible with Kleiber's law. 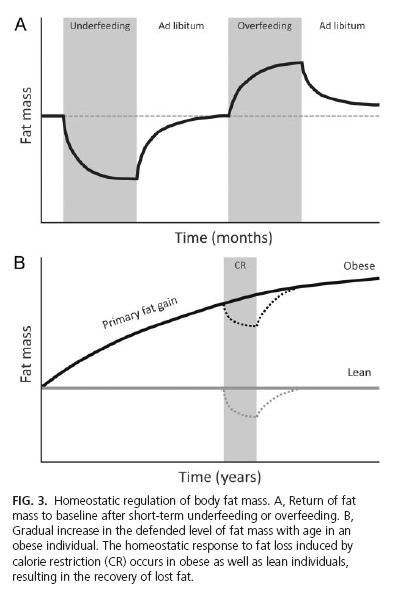 Those reductions themselves should be positively correlated with the ratio of time spent in the obese and lean states. Someone who was obese at 95 kg should have a metabolic rate approximately 5.6 percent lower than a never obese person, soon after reaching a weight of 68 kg (5.6 percent = [2,508 – 2,374] / 2,374). If the compensatory adaptation can be reversed, as I believe it can, we should see slightly lower percentage reductions in studies including formerly obese participants who had been lean for a while. This expectation is consistent with empirical evidence. For example, a study by Astrup and colleagues () concluded that: “Formerly obese subjects had a 3–5% lower mean relative RMR than control subjects”. Another implication, which is related to the one above, is that someone who becomes obese and goes right back to lean should not see that kind of inertia. That is, that person should go right back to his or her lean resting metabolic rate. Perhaps Drew Manning’s Fit-2-Fat-2-Fit experiment () will shed some light on this possible implication. A person becoming obese and going right back to lean is not a very common occurrence. Sometimes this is done on purpose, for professional reasons, such as before and after photos for diet products. Believed it or not, there is a market for this! - Calorie expenditure estimation varies a lot depending on the equation used. The multiplier used here was 78, based on Cunningham’s equation, and assuming 10 percent body fat. The calorie expenditure for the same 68 kg person using Katch-McArdle’s equation, also assuming 10 percent body fat, would be about 1,692 calories. That would lead to a different multiplier. - The really important thing to keep in mind, for the purposes of the discussion presented here, is the relative decrease in energy expenditure at rest, per unit of weight, as weight goes up. So we stuck with the 78 multiplier for illustration purposes. - There is a lot of variation across individuals in energy expenditure at rest due to other factors such as nonexercise activity thermogenesis (). 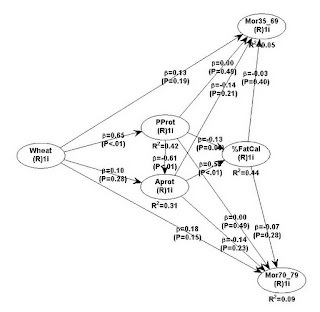 It is not very hard to find studies supporting one diet or another. Gardner and colleagues, for example, conducted a study in which the Atkins diet came out on top when compared with the Zone, Ornish, and LEARN diets (). 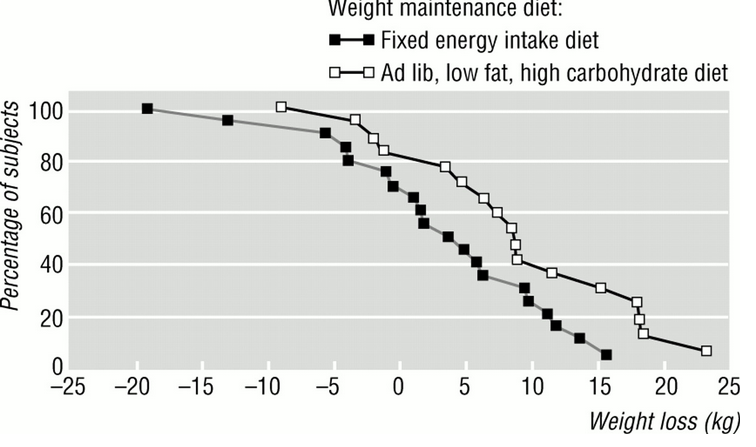 In Dansinger and colleagues’ study (), on the other hand, following the Atkins diet led to relatively poor results compared with the Ornish, Weight Watchers, and Zone diets. Often the diets compared have different macronutrient ratios, which end up becoming the focus of the comparison. 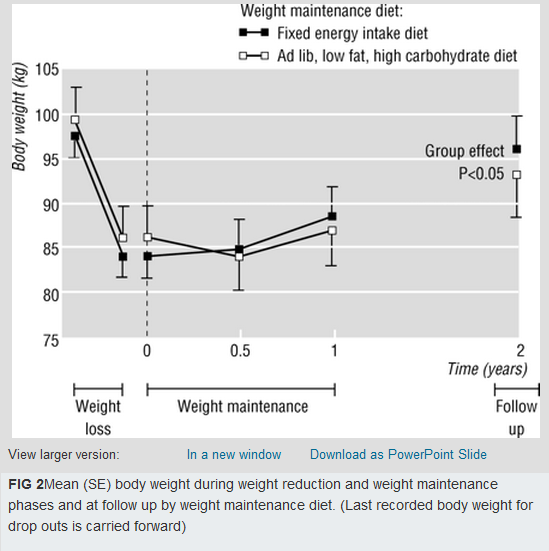 Many consider Sacks and colleagues’ conclusion, based on yet another diet comparison study (), to be the most consistent with the body of evidence as a whole: “Reduced-calorie diets result in clinically meaningful weight loss regardless of which macronutrients they emphasize”. I think there is a different conclusion that is even more consistent with the body of evidence out there. This conclusion is highlighted by the findings of almost all diet studies where participants were followed for more than 1 year. But the relevant findings are typically buried in the papers that summarize the studies, and are almost never mentioned in the abstracts. 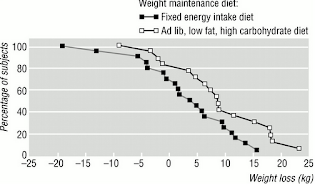 Take for example the study by Toubro and Astrup (); Figure 3 below is used by the authors to highlight the study’s main reported finding: “Ad lib, low fat, high carbohydrate diet was superior to fixed energy intake for maintaining weight after a major weight loss”. But what does the figure above really tell us? It tells us, quite simply, that both diets succeeded at first, and then eventually failed. One failed slightly less miserably than the other, in this study. 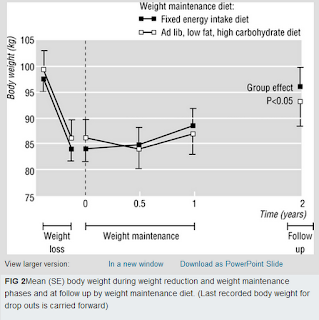 The percentage of subjects that maintained a weight loss above 25 kg (about 55 lbs) approached zero after 12 months, in both diets. This leads us to the conclusion below, which is always missing in diet studies even when the evidence is staring back at us. This is arguably the conclusion that is the most consistent with the body of evidence out there. All diets succeed at first, and eventually fail. In using the terms “succeed” and “fail” I am referring to the diets’ effects on the majority of the participants. This is in fact better demonstrated by the figure below, from the same study by Toubro and Astrup; it is labeled as Figure 2 there. Most of the participants at a certain weight, lose a lot of weight within a period of 1 year or so, and after 2 years (see the two points at the far right) are at the same original weight again. What is the average time to regain back the weight? From what I’ve seen in the literature, all the weight and some tends to be regained after 2-3 years. The regained weight is not at all lean body mass. It is primarily, if not entirely, body fat. In fact, many studies suggest that those who diet tend to have a higher percentage of body fat when they regain their original weight; proportionally to how fast they regain the weight lost. Since the extra body fat tends to cause additional problems, which are compounded by the dieting process’ toll on the body, those dieters would have been slightly better off not having dieted in the first place. Guyenet and Schwartz have recently authored an article that summarizes quite nicely what tends to happen with both obese and lean dieters (). Take a look at Figure 2 of the article below. The obese need to lose body fat to improve health markers, and avoid a number of downstream complications, such as type 2 diabetes and cancer (). Yet, with very few exceptions, the obese (and even the overweight) remain obese (or overweight) after dieting; regardless of the diet. So what about those exceptions, what do they do to lose significant amounts of body fat and keep it off? Well, I rarely use myself as an example for anything in this blog, but this is something with which I unfortunately/fortunately have personal experience. I was obese, lost about 60 lbs of weight, and kept it off for quite a while already (). Like most of the formerly obese, I can very easily gain body fat back. But I don’t seem to be gaining back the formerly lost body fat, and the reason is consistent with some of the studies based on data from the National Weight Control Registry, which stores information about adults who lost 30 lbs or more of weight and kept it off for at least 1 year (). I systematically measure my weight, body fat percentage, and a number of other variables; probably even more than the average National Weight Control Registry member. Based on those measurements, I try to understand how my body responds in the short and long term to stimuli such as different exercise, types of food, calorie restriction, sleep patterns etc. And I act accordingly to keep any body fat gain from happening; by, for example, varying calorie intake, increasing exercise intensity, varying the types of food I eat etc. With a few exceptions (e.g., avoiding industrial seed oils), there is no generic formula. Customization based on individual responses and cyclical patterns seems to be a must. Looking back, it was relatively easy for me to lose all that fat. This is consistent with the studies summarized in this post; all diets that rely on caloric reduction work marvelously at first for most people. The really difficult part is to keep the body fat off. I believe that this is especially true as the initial years go by, and becomes easier after that. This has something to do with initial inertia, which I will discuss soon in a post on metabolic rates and their relationship with overall body mass. For people living in the wild, I can see one thing working in their favor. And that is not regular starvation; sapiens is too smart for that. It is laziness. Hunger has to reach a certain threshold for people to want to do some work to get their food; this acts as a natural body composition regulator, something that I intend to discuss in one of my next posts. It seems that people almost never become obese in the wild, without access to industrial foods. As for living in the wild, in spite of the romantic portrayals of it, the experience is not as appealing after you really try it. The book Yanomamo: The Fierce People () is a solid, if not somewhat shocking, reminder of that. I had the opportunity to meet and talk at length with its author, the great anthropologist Nap Chagnon, at one of the Human Behavior and Evolution Society conferences. The man is a real-life Indiana Jones (). 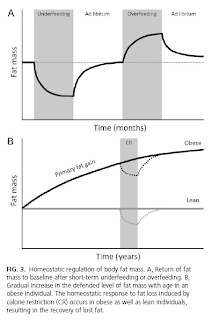 In the formerly obese, the body seems to resort to “guerrilla warfare”, employing all kinds of physiological and psychological mechanisms, some more subtle than others, to make sure that the lost fat is recovered. Why? I have some ideas, which I have discussed indirectly in posts throughout this blog, but I still need to understand the whole process a bit better. My ideas build on the notion of compensatory adaptation (). You might have heard some very smart people say that you do not need to measure anything to lose body fat and keep it off. Many of those people have never been obese. Those who have been obese often had not cleared the 2-3 year “danger zone” by the time they made those statements. There are many obese or overweight public figures (TV show hosts, actors, even health bloggers) who embark on a diet and lose a dramatic amount of body fat. They talk and/or write for a year or so about their success, and then either “disappear” or start complaining about health issues. Those health issues are often part of the “guerrilla warfare” I mentioned above. A few persistent public figures will gain the fat back, in part or fully, and do the process all over again. It makes for interesting drama, and at least keeps those folks in the limelight. 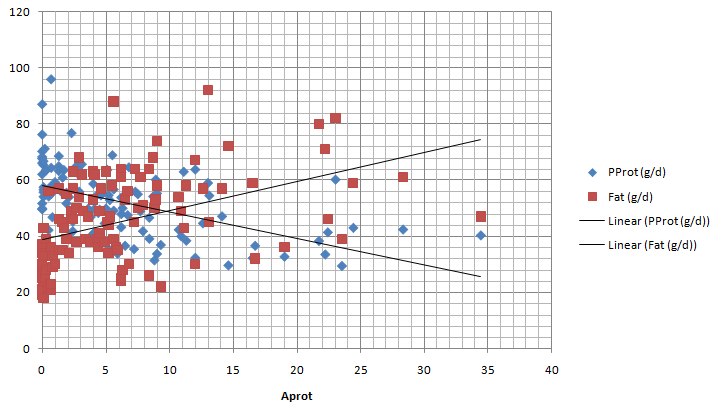 The graph below shows the results of a multivariate nonlinear WarpPLS () analysis including the variables listed below. Each row in the dataset refers to a county in China, from the publicly available China Study II dataset (). As always, I thank Dr. Campbell and his collaborators for making the data publicly available. Other analyses based on the same dataset are also available (). - Wheat: wheat flour consumption in g/d. - Aprot: animal protein consumption in g/d. - PProt: plant protein consumption in g/d. - %FatCal: percentage of calories coming from fat. - Mor35_69: number of deaths per 1,000 people in the 35-69 age range. - Mor70_79: number of deaths per 1,000 people in the 70-79 age range. 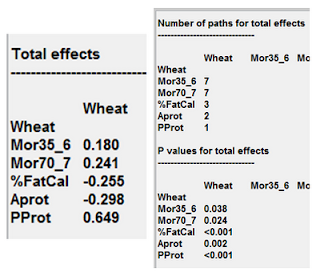 Below are the total effects of wheat flour consumption, along with the number of paths used to calculate them, and the respective P values (i.e., probabilities that the effects are due to chance). Total effects are calculated by considering all of the paths connecting two variables. Identifying each path is a bit like solving a maze puzzle; you have to follow the arrows connecting the two variables. Version 3.0 of WarpPLS (soon to be released) does that automatically, and also calculates the corresponding P values. To the best of my knowledge, this is the first time that total effects are calculated for this dataset. 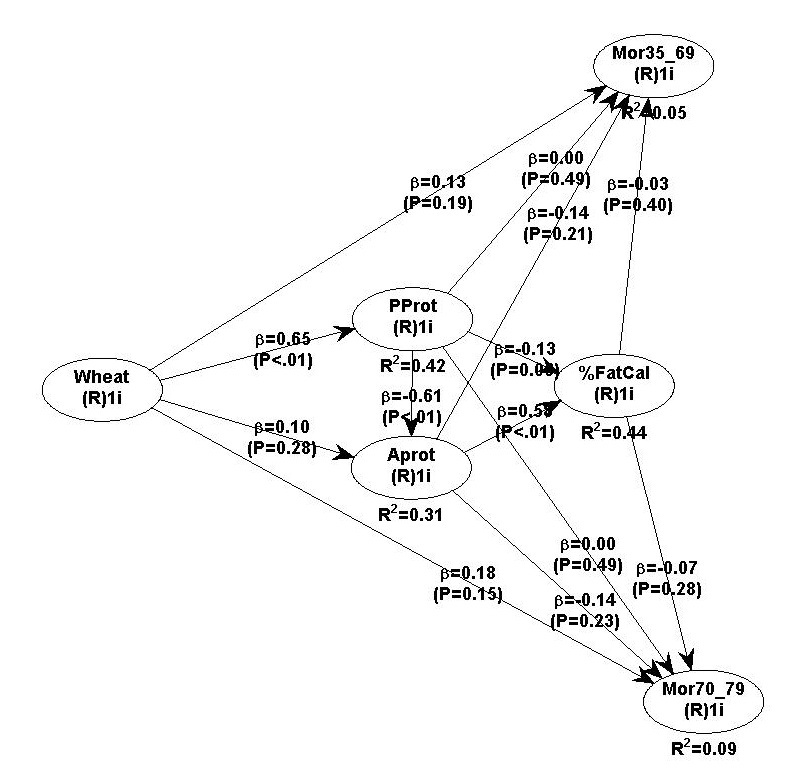 As you can see, the total effects of wheat flour consumption on mortality in the 35-69 and 70-79 age ranges are both significant, and fairly complex in this model, each relying on 7 paths. The P value for mortality in the 35-69 age range is 0.038; in other words, the probability that the effect is “real”, and thus not due to chance, is 96.2 percent (100-3.8=96.2). The P value for mortality in the 70-79 age range is 0.024; a 97.6 percent probability that the effect is “real”. Note that in the model the effects of wheat flour consumption on mortality in both age ranges are hypothesized to be mediated by animal protein consumption, plant protein consumption, and fat consumption. These mediating effects have been suggested by previous analyses discussed on this blog (). The strongest individual paths are between wheat flour consumption and plant protein consumption, plant protein consumption and animal protein consumption, as well as animal protein consumption and fat consumption. So wheat flour consumption contributes to plant protein consumption, probably by being a main source of plant protein (through gluten). Plant protein consumption in turn decreases animal protein consumption, which significantly decreases fat consumption. From this latter connection we can tell that most of the fat consumed likely came from animal sources. How much fat and protein are we talking about? The graphs below tell us how much, and these graphs are quite interesting. They suggest that, in this dataset, daily protein consumption tended to be on average 60 g, whatever the source. If more protein came from plant foods, the proportion from animal foods went down, and vice-versa. The more animal protein consumed, the more fat is also consumed in this dataset. And that is animal fat, which comes mostly in the form of saturated and monounsaturated fats, in roughly equal amounts. How do I know that it is animal fat? Because of the strong association with animal protein. By the way, with a few exceptions (e.g., some species of fatty fish) animal foods in general provide only small amounts of polyunsaturated fats – omega-3 and omega-6. Individually, animal protein and wheat flour consumption have the strongest direct effects on mortality in both age ranges. Animal protein consumption is protective, and wheat flour consumption detrimental. Does the connection between animal protein, animal fat, and longevity mean that a diet high in saturated and monounsaturated fats is healthy for most people? Not necessarily, at least without extrapolation, although the results do not suggest otherwise. Look at the amounts of fat consumed per day. They range from a little less than 20 g/d to a little over 90 g/d. By comparison, one steak of top sirloin (about 380 g of meat, cooked) trimmed to almost no visible fat gives you about 37 g of fat. These results do suggest that consumption of animal fats, primarily saturated and monounsaturated fats, is likely to be particularly healthy in the context of a low fat diet. Or, said in a different way, these results suggest that longevity is decreased by diets that are low in animal fats. How much fat should one eat? In this dataset, the more fat was consumed together with animal protein (i.e., the more animal fat was consumed), the better in terms of longevity. In other words, in this dataset the lowest levels of mortality were associated with the highest levels of animal fat consumption. The highest level of fat consumption in the dataset was a little over 90 g/d. What about higher fat intake contexts? Well, we know that men on a high fat diet such as a variation of the Optimal Diet can consume on average a little over 170 g/d of animal fat (130 g/d for women), and their health markers remain generally good (). One of the critical limiting factors, in terms of health, seems to be the amount of animal fat that one can eat and still remain relatively lean. Dietary saturated and monounsaturated fats are healthy. But when accumulated as excess body fat, beyond a certain level, they become pro-inflammatory. At the time of this writing, there was no Wikipedia article for the term “meatza”, which surprised me a bit given the number of recipes on the web. In fact, I could not find anything concrete about the dish’s tradition or history. Another thing that surprised me about this dish is how much my family and I like it. It has become a regular weekend treat for us for quite some time now. The recipe below is for a meal that feeds 4-8 people. Like in my previous recipe for a zucchini and onion meatloaf (), the ground beef used here has little fat, and thus a relatively low omega-6 content. Most of the fat comes from the ground bison, which has a higher omega-3 to omega-6 ratio. - Prepare some dry seasoning powder by mixing sea salt, parsley flakes, garlic powder, chili powder, and a small amount of cayenne pepper. - Mix 2 lb of very lean ground beef (96/4) with 1 lb of ground bison. - Add the dry seasoning and a whole egg to the ground meat mix. - Vigorously mix by hand until you get a homogeneous look. - Place the mix into a sheet pan coated with olive oil. Richard’s suggestion of creating edges helps keep the sautéed vegetables on top, when they are added later (). - Preheat oven to 375 degrees Fahrenheit. - Bake the meatza for about 15 minutes. - Grate 1 lb of aged cheese. - Slice one tomato, half an onion, and one green bell pepper, and sauté them in olive oil. - Drain the meatza after if comes out of the oven, and add the sautéed vegetables to the top, together with half a can of tomato sauce. - Add the 1 lb of grated aged cheese on top of the vegetables and tomato sauce. 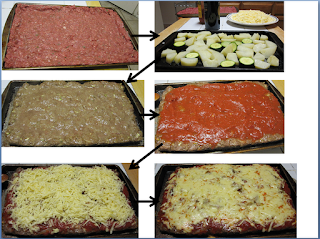 - Return meatza to the oven, still at 375 degrees Fahrenheit, and bake it for about 10 minutes. The photo montage above shows a side dish of baked potatoes and zucchini. That is optional, as the meatza has vegetables added to it. I usually cut the meatza into 8 rectangular pieces. Each rectangle will have about 50 g of protein and 20 g of fat. The fat will be primarily saturated and monounsaturated (both healthy), with a good balance of omega-3 and omega-6 fats. 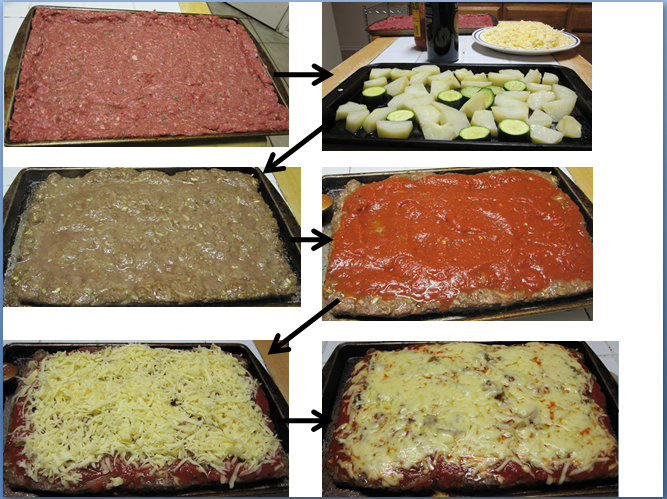 Each piece of meatza will also be a good source of vitamins B12 and B6, niacin, calcium, zinc, selenium, and phosphorus. It is not uncommon for those who do weight training to see no gains over long periods of time for certain weight training exercises (e.g., overhead press), even while they experience gains in other types of exercise (e.g., regular squats). 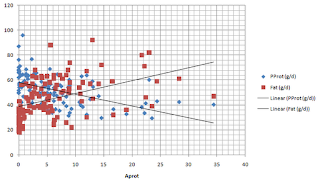 HealthCorrelator for Excel (HCE) and its main outputs, coefficients of association and graphs (), have been helping some creative users identify the reasons why they see no gains, and break out of the stagnation periods. It may be a good idea to measure the number of seconds of effort per set; in addition to other variables such as numbers of sets and repetitions, and the amount of weight lifted. In some cases, an inverted J curve, full or partial (just the left side of it), shows up suggesting that the number of seconds of effort in a particular type of weight training exercise is a better predictor of muscle gain than the number of repetitions used. The inverted J curve is similar to the one discussed in a previous post on HCE used for weight training improvement, where the supercompensation phenomenon is also discussed (). Repetitions in the 6-12 range are generally believed to lead to peak anabolic response, and this is generally true for weight training exercises conducted in good form and to failure. It is also generally believed that muscular effort should be maintained for 20 to 120 seconds for peak anabolic response. The problem is that in certain cases not even 12 repetitions lead to at least 20 seconds of effort. This is usually the case when the repetitions are performed very quickly. There are a couple of good reasons why this may happen: the person has above-average muscular power, or the range of motion used is limited. What is muscular power, and why would someone want to limit the range of motion used in a weight training exercise? Muscular power is different from muscular strength, and is normally distributed (bell curve) across the population, like most human traints (). Muscular power is related to the speed with which an individual can move a certain amount of weight. Muscular strength is related to the amount of weight moved. Frequently people who perform amazing feats of strength, like Dennis Rogers (), have above-average muscular power. As for limiting the range of motion used in a weight training exercise, one of the advantages of doing so is that it reduces the risk of injury, as a wise commenter pointed out here some time ago (). It also has the advantage of increasing the number of variations of an exercise that can be used at different points in time; which is desirable, as variation is critical for sustained supercompensation (). The picture below is from a YouTube video clip showing champion natural bodybuilder Doug Miller performing 27 repetitions of the deadlift with 405 lbs (). Doug is one of the co-authors of the book Biology for Bodybuilders, which has been reviewed here (). The point of showing the video clip above is that the range of repetitions used would be perceived as quite high by many bodybuilders, but is nevertheless the one leading to a peak anabolic response for Doug. If you pay careful attention to the video, you will notice that Doug completes the 27 repetitions in 45 seconds, well within the anabolic range. If he had completed only 12 repetitions, at about the same pace, he would have done that a few seconds before hitting the 20-second mark. Doug completes those 27 repetitions relatively quickly, because he has above-average muscular power, in addition to having above-average muscular strength.